Posted October 21, 2018 by Diane & filed under Discussion Questions, My Books. 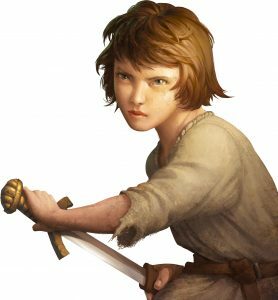 This is the first post in a series of in-depth discussion questions, to accompany my Teachers’ Guide, or simply be a guide for anyone reading The Mad Wolf’s Daughter with a group. 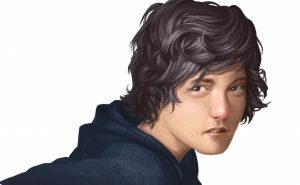 Anyone who’s read The Mad Wolf’s Daughter will have a few adjectives they might use to describe my protagonist, Drest. “Strong” is probably the first. And “strong”—physically, emotionally, morally—is accurate. It was great fun to write a girl character who was so powerful. I’ve been hearing the word “strong” used a lot these days as people talk about role models for kids. Yet in watching kids—and grownups too—I’ve begun to wonder: What does being “strong” mean as a crucial attribute? Let’s unpack a little what “strength” means, if you will. And let’s start with this: How does being told that strength is crucial if you don’t consider yourself strong, or capable of being strong? Lots of kids I know wouldn’t use that word to describe themselves. It can be a positive word, certainly, but it can also be a word that beats down on kids who aren’t physically powerful or dominant or in charge. A small kid might not consider themselves strong. An introvert who can barely talk in class might not either. I worry about what we’re telling them if we’re always showing one version of strength—the one that fits a physically powerful extrovert—as the only way to be. What does strength mean to you? Is it crucial to you, in your own life, to be strong? What are alternatives? In my book, Drest has incredible military training. I think most readers will get that: She’s practiced wielding a sword since she could first lift it. But one of the women she meets early on (and she’s never met a woman until she starts on her adventure) impresses her, and Drest can’t quite describe her accurately. This is Wimarca, a healer, of whom everyone seems to be afraid. Is Wimarca strong? What do readers think? She’s old, wears a cloak of many different stinky animal skins, and a string of mouse skulls around her neck. She also totters somewhat, and needs an arm at times to help her. But she’s an incredible medieval medical professional. Her salves keep Emerick, who is dealing with a serious injury throughout the book, going at a crucial time. Her remedies do a lot of good for a village boy whom Drest almost does in. The people of Wimarca’s village have experienced her talents. She’s a healer, not a fighter, physically weak. But everyone listens to her. And values her. Drest likes her military training and playing around with a sword and challenging herself physically, but she becomes aware of what it means to be something other than her version of “strong.” And she tries, in the first book, to fit Wimarca into that box of “strong,” equating “strong” with “good,” but can’t quite do it. Tig, one of my three main characters, jokes at his own lack of strength. I’ve found that while a lot of kids love Drest, quite a few say that Tig is their favorite character. So here’s another few discussion questions: Is it crucial for everyone, in the greater world, beyond you and your own life, to be strong? What are ways in which different people can be strong? Personally, I think it’s wonderful to have someone like Drest in the world, standing up for everyone left and right (and I wish there were more people like her). But not everyone can do that. And I think it’s crucial to have people like Tig and Wimarca in the world, people with talents in other ways. And I think it’s most crucial to be proud of who you are.